RVGL is now available on Android based devices (phones, tablets, etc). It should work on any recent Android device, technically 2.x and newer, supporting both 32-bit and 64-bit ARM / x86 targets. A GPU supporting at least OpenGL ES 2.0 is required. However, it can be made to run on OpenGL ES 1.1 by using the legacy fixed pipeline renderer. 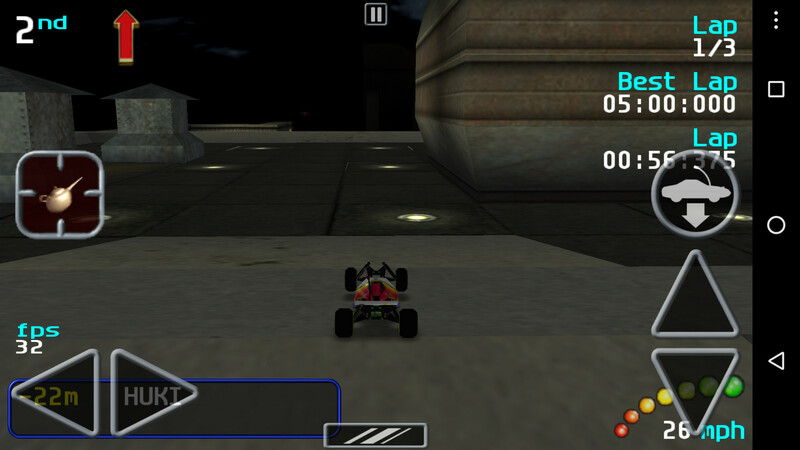 The Android version features a new Touch UI and virtual joypad support, with buttons designed by RV Passion (see one of the preview screenshots below). The latest android build is available from the RVGL project page. Controller Map: Android app that allows generating SDL GameController mappings for controllers. Create a folder named RVGL in your phone's internal storage and extract the game data into it. Optionally extract the Dreamcast content pack into the same location. Install and run the APK. Note: If you have already run the app, it should have automatically generated an RVGL folder for you with updated assets. In this case, extract the full game data into this folder, taking care not to overwrite any of the existing files (i.e., say NO to replace). Generated files: A few files are generated by the game on first run. The log file is generated at profiles/re-volt_log.txt. Running the Controller Map app saves controller mappings to profiles/gamecontroller_log.txt. A file named rvgl_version.txt can be located in the RVGL folder. Deleting it will force the game to re-extract the latest assets included in the apk. To display frame rate, edit profiles/rvgl.ini and set ShowFPS to 1. To use the legacy ES 1.1 renderer, edit profiles/rvgl.ini and set Shaders to 0. Improving performance: The shader-based renderer might benefit from WorldCut optimized world files, which can be downloaded from here. Starting from 18.1126a, optimized world files are included in the APK. When the car is upside down, tap anywhere in the centre of the screen (or on the car itself) to flip the car. UI navigation: tap anywhere outside a menu box to go back to the previous screen. The following issues / limitations are applicable to the latest RVGL running on Android. The game starts in Portrait mode by default and needs to be manually rotated into Landscape mode. Brightness / contrast don't seem to be working. Copy / pasting IP address is not supported yet. Pressing backspace on the virtual keyboard keeps backspacing on some devices (cause unknown). I love it. I just love it. There are some issues that I'd like to see fixed, no deal breakers, just stuff that could improve the general experience. Bigger menu buttons: On lower dp they may look fine, but at 513 dp on a 5" they are a bit too hard to get consistently. 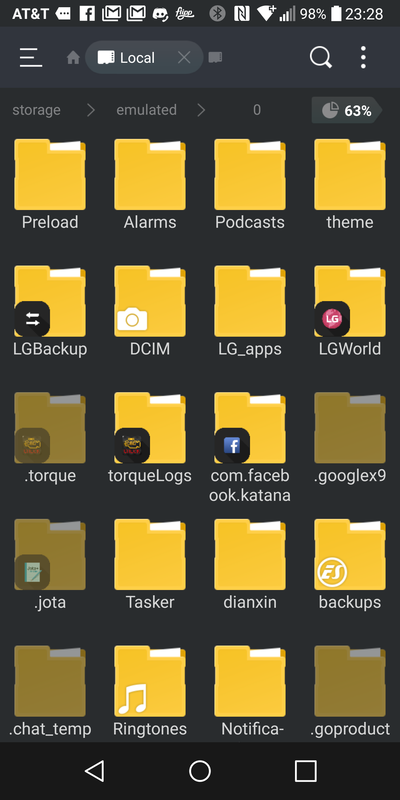 Medias: Simply make the game add a blank file called '.nomedia' in the RVGL folder (without quotes) so that android's media provider skips the folder and we don't get our gallery apps flooded with rvgl's game files. Last edited by ciccio on Sat Mar 10, 2018 9:01 am, edited 1 time in total. Absolutely awesome work Huki, runs beautifully on my Galaxy Note 4. I can't wait to see the blue tooth controller implementation. Thank you for your dedication to this game. On another note is there any way for me to set the directory to "/storage/79B1-5038/RVGL" that's where my sd card is. The Android build has been updated to 18.0315! Utilizes SDL 2.0.8 which provides better Android support and drastically improved framerates. Shader edition starts faster due to shader caching. A 16-bit RGB565 framebuffer is used by default, to match Android's surface format. GLES3 features support: Antialiasing is now available on supported mobile hardware. Spectate after race finish by tapping the screen. Fixed championship end screens getting skipped. Can now tap on the carbox and track screen. Adjusted certain menu screens for portrait mode. Includes Android 7 style round icons. Keep screen on during gameplay. More stable app switching (minimize / resume) support. Immersive Fullscreen mode: the action bar is now properly hidden. Adds a .nomedia file to the RVGL folder. Message boxes are now working. Fixed inability to delete profiles. Note: This release is compatible with 18.0310 and later online. Thanks! There is currently no way to use an external SD card, but it should be supported in the future. I don't have a high DPI device with me, so I'd need to see some kind of video showing RVGL gameplay on such a device. Then we'll see how we can improve it. Idk why the car slow down automatically on newest version, i don't touching brake tap. To fix just add a newline to the end of Parameters.txt. -Some tracks also cause the game to not even start upon launching it. I've yet to research as to why this happens though. But MAYBE also has to do with .inf files that don't end with a newline, but I cannot confirm it yet. This is awesome! I just tried the game on my good old Nexus 6, it runs extremely smoothly and the touchscreen controls are easy to use. Good job! - the game seems to often crash when you quit it (with a system popup "RVGL has stopped"). - is it possible to import your player profile from a desktop version of the game? Copy-pasting my Profiles folder didn't seem to do the trick. - it doesn't seem possible to enable antialiasing in the video settings. - I couldn't get the app to load with my own copy of the game data and had to re-download a fresh copy from Re-Vold I/O. This is probably linked to Lu9's comment above, where some tracks prevent the game from starting. - when you long press delete when typing the player name, it will stay stuck in a "deleting state" until you long press delete again. A slight oversight, I dare say. I can't make in storage directly either. Because Koreans LG are retarded. Previously-active member of Re-Volt Live. Contributor of silly things. Smart enough to be dangerous. I newer tried the Android version, cause i have no fitting phone. But I heard several times, that there is no turnover button. Instead, you just have to tap on the screen to turn over your car. Glad to see the feedback! That's an interesting find, I'll check it soon. Was this the case with the older 18.0310 version too? Copying your profile folder from the desktop should work 100%. It is possible that the Android file system is case-sensitive like Linux. That means you need to rename all your files to lower case before you import them. I presume you're on Windows, so you might need to look for some automatic renaming utility. Antialiasing option is available in Render Settings. Is it greyed out? If so, can you post your re-volt_log.txt from the phone? - I couldn't get the app to load with my own copy of the game data and had to re-download a fresh copy from Re-Vold I/O. This again points to case-sensitivity issues. The game data at I/O is already renamed to lower case, so that explains why it worked. Can it be implemented in the next version when you touch the button, whether it is light colored and when not the original color? This happens to me when I put the cellphone only vertical mode (Only in the first start), it's a Moto E2. And this happened to me when I opened the rvgl, if I do not touch the rvgl start screen, the phone completely stopped. That happens in some Android's. The Android build has been updated to 18.0330! Controller Settings can be configured (useful for phones with a hardware keyboard, or with wireless controllers). Virtual buttons opacity can be changed (default at 50%). Camera View can be changed from Game Settings. The list of storage paths supported is extended to supported emulated paths (eg, "storage/emulated/0"). App now displays the proper version number. MP3 music is now supported. Fixed certain custom cars and tracks hanging the app at startup / loading. Fixed broken per-instance vertex shading (RgbPer). Wrong padding of text elements (reported here). 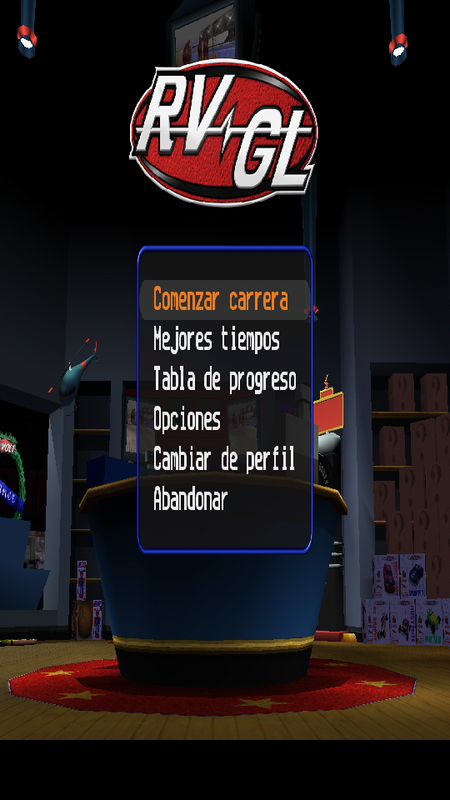 Level modes are switched in progress table order (Normal,R,M,RM) at the level selection screen. Display record time in time trial mode. Note: This release is compatible only with 18.0330 online. The Android build has been updated to 18.0410! Fixed crash when quiting from the main menu on newer Android devices. New features from 18.0410a (read release post). Note: This release is compatible with 18.0330 and above online. I've tried quitting and restarting the game quite a few times, and indeed, I no longer seem able to make it crash. Good work! Super cool, I'm already a fan of this haha! The Android build has been updated to 18.0416! Note: This release is only compatible with 18.0416 online. I tested this on my GPD XD Plus and it works great. Loads up faster than my Linux PC. Multiplayer also works good with rvgl on Linux over LAN. I have yet to test with other people online, but I have some friends who may help with that sometime soon. It also seems to work with the custom cars and tracks that we use. A few issues I have though. The controller doesn't work with the menus at all and hitting backspace on the virtual keyboard keeps backspacing until you close out of the app and re-open it. Also the game sound/music glitches out if you exit out of the demo. Have to swipe the game away in recents to fix it. Other than that, great job on the port! I am glad to finally have a portable version of rvgl. Edit: Just noticed another random bug. The joysticks sometimes don't get picked up. Closing out of the app and re-opening seems to make them work again. They only work with the Xbox layout. The PS3 layout registers them as buttons. Edit 2: Just did some testing with a friend of mine. Online multiplayer works well and seems stable. Couple other issues though. The hostname entry box makes what you are typing disappear if it is a long hostname. It seems to still work though. Also there is no horn button on the touch screen. The Android version is updated to 18.0428a. Download it from the release post. As of this release, there is a single apk that provides both the shader-based and legacy rendering modes. The shader-based renderer is enabled by default, so 's' users should simply be able to update to the new build. When the shader mode is active, you should see the build number display in the main menu turn yellow. @deathspawn: Thanks for the feedback! Only touch inputs are supported for the menus on Android, this is a known limitation for now. I've heard about the backspacing glitch before, but I'm unable to reproduce it on my Android 4.1 device. I'll look more into it though. The hostname entry box makes what you are typing disappear if it is a long hostname. It seems to still work though. The hostname box "scrolls" long lines, but you should see an ellipsis at the start, hinting at more hidden text. But yes, it does keep the full hostname string. The latest RVGL alpha on Android enables the shader-based renderer by default. The previous alphas were using the legacy renderer and it appears that worked fine for you. You can edit your rvgl.ini and disable the shader renderer, but it's better that we try and get shader mode working. I'll need to see your profiles/re-volt_log.txt file from the phone.